we adopted alli from the pound. A breeder could not sell all his puppies and gave them away to the pound. Alli got her name because when she was a puppy she snapped her teeth all the time and it sounded like and alligator. Hello to you Jared. 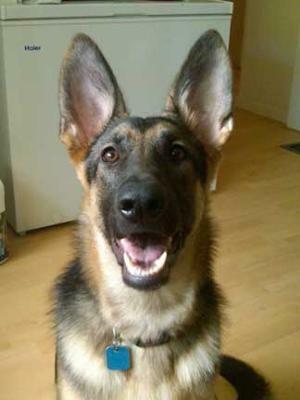 Thanks so much for taking the time to come here and share your own personal German Shepherd rescue story and picture of your beautiful German Shepherd pup Alli with us all here. I once had a coated German Shepherd named Ally so I really like the name. And what a great picture of your Alli too. She looks so happy and content in her new surroundings. Beautiful picture by the way. Anyway, it is a great photo of Alli and it is so nice to see her smiling. Nicely done - she is just so pretty! You are very lucky to have found her, she is very pretty. She is lucky to have found a great home as well.